When I said, “YES!” to my favorite guy on earth, I never imagined what all we would go through next. I lived in Costa Rica as a missionary teacher and as fate would have it, fell in love with that handsome Tico man I call mine. I knew we had a long road of immigration and piles of paperwork ahead of us, but I could not wait to start planning. The problem? I was in Costa Rica and we were planning a wedding in Mississippi. At first I thought it would be an impossible feat but since then, I have met and talked to many people who had to plan their wedding from a distance. Granted, most of them were before the days of Pinterest but the point is, it can be done. And, you can do it without sacrificing the things you really want. Here are some tips for how you can plan your wedding from a distance without going absolutely insane. A total Type-A, list maker, event planner by nature (and education), I am a control freak to the core. Therefore, the first few months of me trying to manage every little detail served up a grandé-size plate of dissatisfaction. Loosening the reigns doesn’t mean that you won’t get the wedding day of your dreams; it just means you take on less stress in the process. Take off the “Control” hat and throw it out with those old bridesmaids dresses you’re never wearing again. You’ll be much happier for it. There are just some things that you will not be able to do because you are not there. Enter: wedding planner. My mom and I decided that hiring someone who would act as a liaison would be well worth the money. If you can work it into your budget, hire someone who can add check marks to that to-do list for you. If you’re trying to cut costs, learn to lean on someone you trust. Recruit some of your life cheerleaders to join your planning team and get the job done. You no doubt have people in your corner who are less busy than others – use them! Who wouldn’t want to do a cake tasting for you? Thankfully, our bridal generation is one of outstanding resources. Although I have a wedding planner, I still like to have the final say-so on most things (imagine that). There are even some things that I did myself and never passed through her hands. If not for tech savvy vendors with cool websites and Facebook pages, I would be one lost little bride. Use websites like Wedding Party and post Facebook statuses to find local vendors. Make connections with them online, ask to see their work, packages and pricing details, and build relationships. The more you see and talk to someone, the more you get a feel for their style and you’ll know if theirs matches yours. Another great use of technology is FaceTime. Because I could not meet with vendors in person, I set up Skype or FaceTime meetings to ask questions and get to know them better. It’s never too soon to start planning. Chances are, you already have a wedding board (or ten) on Pinterest. Look back at things you’ve pinned and watch for a consistent theme through all of your pins – rustic, glamorous, vintage, etc. If you’re like us, with 9+ months until wedding day, you might think you have plenty of time. NOT TRUE. Do everything you can while you’re not there because once you arrive you’ll have a whole list of last minute things that need to be done. So you won’t have time to play catch-up. Finalize as many vendors as you can early on. They tend to book up fast and you don’t want to miss out on your first pick because they weren’t available. Planning your wedding from a distance is not as impossible as it may seem. Just remember that: you can do it, you will get through it, and at the end of the day, you’re getting to marry the man of your dreams – and that’s a happy ending!! Ashli Blackwell lives in Ellisville, Mississippi and is all things southern. It took her traveling to 22 other countries to realize just what a southern belle she really is, but she wouldn't have it any other way. Between traveling and being engaged to her favorite Costa Rican, she has a deep appreciation for culture, and tradition. 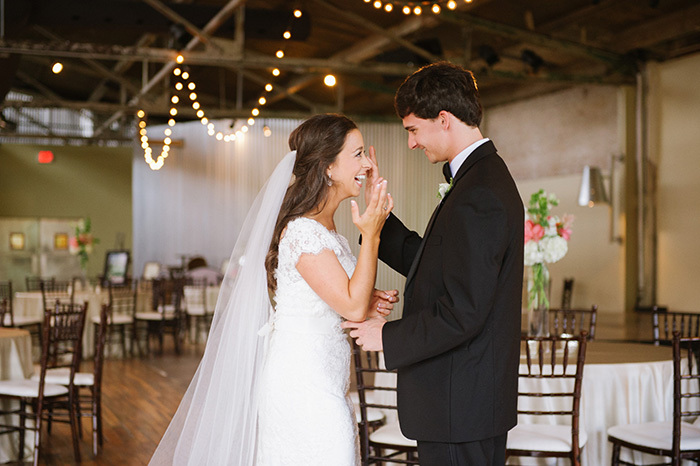 With her mom, she owns, operates, markets, shops for, plans for, and consults for Brookside Barn, a new wedding and event venue in Ellisville. You can find her on Instagram or at her blog. All photos courtesy of April and Paul Photography.